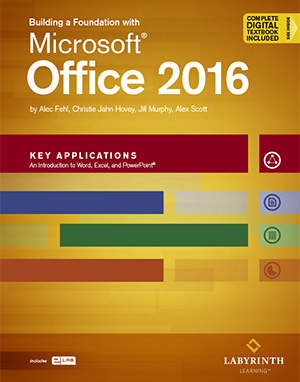 Building a Foundation with Microsoft Office 2016: Key Applications: This in-depth courseware will equip students with a thorough knowledge and understanding of the most relevant features and uses of the three key MS Office applications: Word, Excel and PowerPoint. DELIVERY OPTION: This is the digital ebook only. THIS OPTION DOES NOT INCLUDE THE PRINTED TEXTBOOK. Students will be engaged with hands on learning as they apply learned concepts to create relevant, mock work examples with each application. STUDENTS: Download your resources on the Learning Resource Center . NEW FOR 2016: Lab Learning ebooks never expire! Learn about the purchase options. A new, noticeably thinner textbook design is thanks to a simplified, more concise presentation of concepts. Accompanied with Labyrinth Learning’s all new interactive eBooks, instructors will save time and boost engagement! Our fully interactive eBooks deliver video, bite-sized content, integrated assessments and more to visually reinforce textbook concepts. That’s 0% Paper, 100% Brilliant.